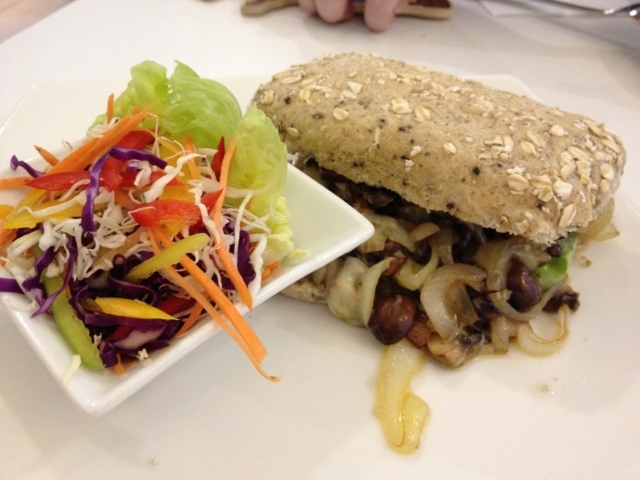 As I am riding on this vegetarian and health wave, we decided to check out what they have for lunch at Eco Green in TTDI. 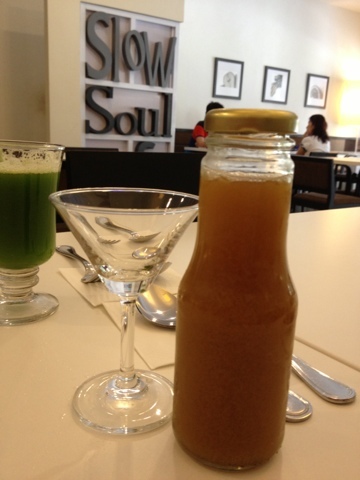 The other day I came to visit the restaurant since they have an attached small grocery that sells organic stuff. I mentally noted that I will come back and try their food -- and here we are! 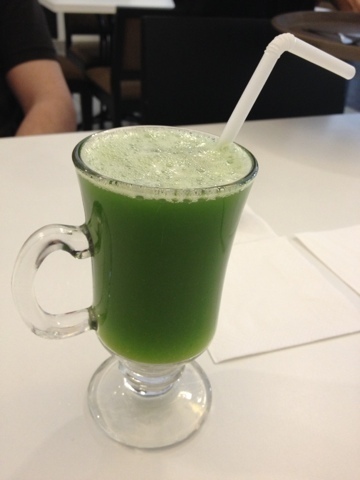 Hubby was still in his juice fasting stage (day 7) and he ordered a Green Juice to start off the meal. It wasn't too bad, but much smaller quantity than what I would usually make. I tried the Fruit Tea that they were having on specials, and it was nice, a bit on the too sweet side, so I diluted it with some water. We ordered 3 sets of meals plus another salad. The Lemongrass salad was different and tasty. However it was a bit disappointing to see salad leaves which had a bit of brownish stuff on it... was hoping their produce would be superior to other salads I have had in other places. 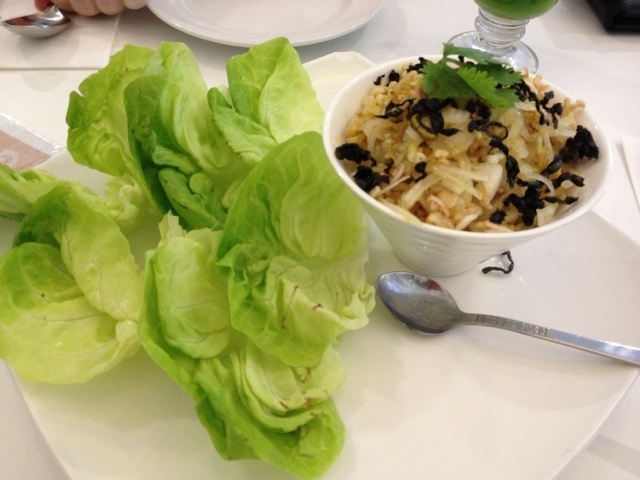 Lemongrass Salad - nice but wish the salad leaves were more fresh! I ordered a sandwich, thinking my daughter might enjoy the mushroom and cheese melt. I was so wrong as she didn't touch it and I ended up tasting it. Not bad, but kind of overpriced for a sandwich. I guess it's due to the fact that everything is organic, hence the hefty price tag. We asked the waiter before ordering this dish, and he assured us that it was not spicy. However, it proved to be false as we found this dish too spicy to our taste. My husband started having hiccups right after a few spoonfuls. And he suffered more hiccups and gassy stomach the whole Sunday afternoon due to this dish. 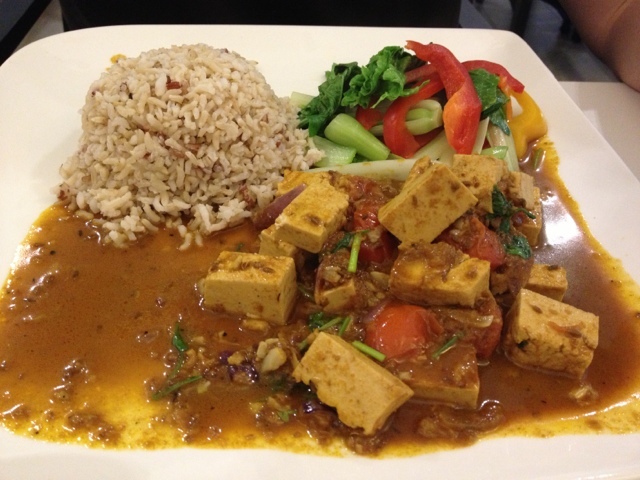 Masala Tofu - too spicy for our taste! 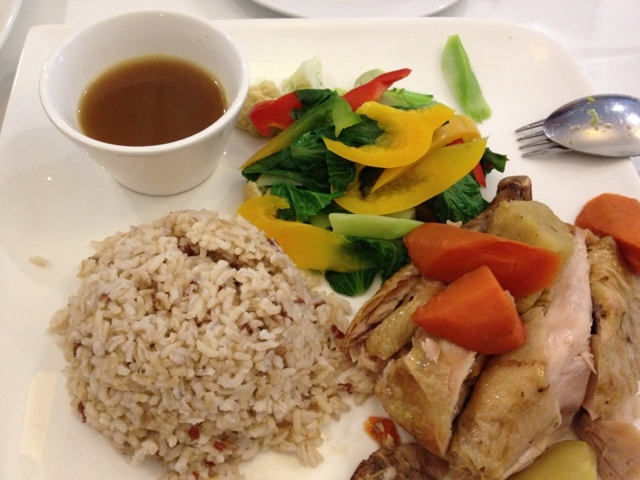 I ordered this roasted chicken meal, which is supposed to be some kind of clean chicken (which they sell at their grocery as well). The soup accompanied it was so small but tasty, I am wondering what powder they added to that broth which made it a bit sweet. My daughter liked it. The chicken was not too tasty-- just okay. I asked if they have tomato sauce, the waiter said no. So I had to enjoy in "au naturel" without any additional seasoning. 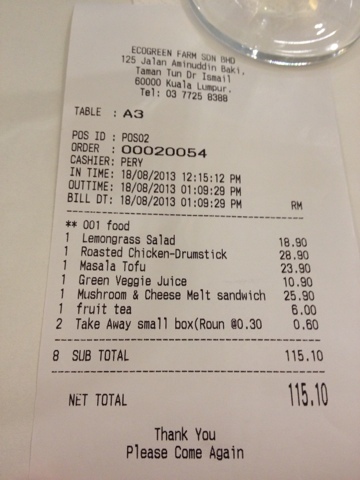 Overall, our bill came out to RM115.10 for the 3 dishes plus a salad and 2 drinks. The price is mainly due to some of the organic ingredients they use, though I am not sure if this place is fully organic. For the ambience, the place is nice and clean. 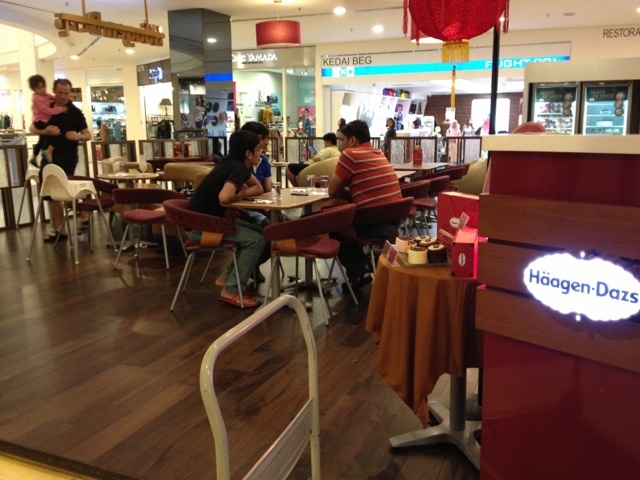 For a Sunday lunch, we were surprised that it had its regular customers... they started trickling in after 1230noon. 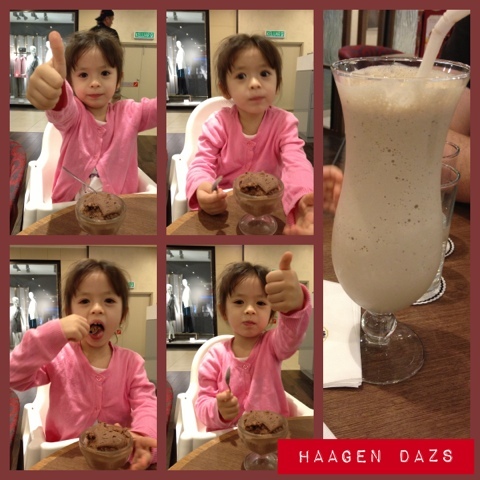 We decided to give our little girl a treat and went to Bangsar Village afterwards for some ice cream. 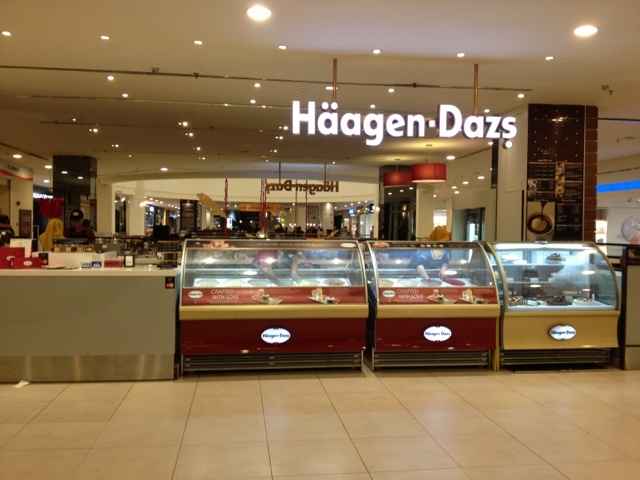 Haagen Dazs in BV2 is spacious and nice seats, so we went there for a little R&R. The menu book that they have is very interesting and colorful, definitely easy for a child to comprehend what is available. 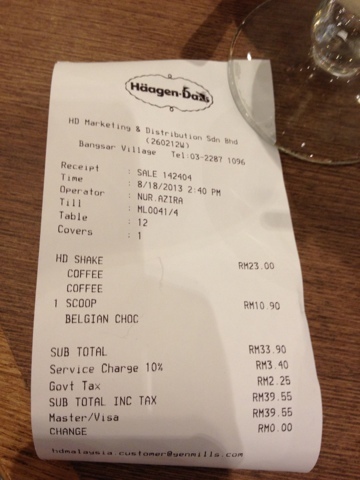 My daughter chose the Belgian Chocolate while I indulged on a milkshake. 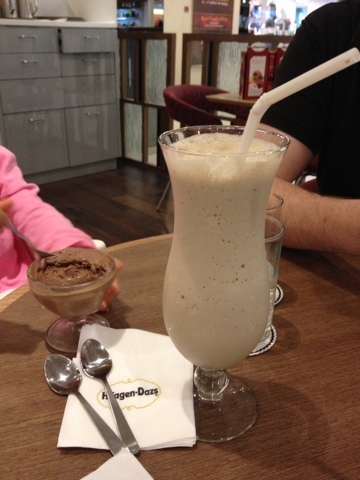 Last pregnancy, when I was still working at KLCC, I would succumb to the Coffee Milkshake of Haagen Dazs every now and then... so thinking of the old days, I took the Coffee Milkshake again. It was yummy, though it didn't give me the same satisfaction I thought it would. Maybe my milkshake standards have gone up? Was it because I was still thinking of that Once Upon A Milkshake I had earlier (see review of that HERE). Anyway, we enjoyed our stay there as it was spacious and the seats were comfortable. They have babu high chair available, so that means my daughter fully enjoyed her scoop of chocolate ice cream. I find that the place is over-staffed and despite seeing so many staff around, it was a little challenging catching their attention (to get more water, the bill, etc). I guess I should be used to the Malaysian type of service by now... anyway we were not rushing for anything so it was okay. 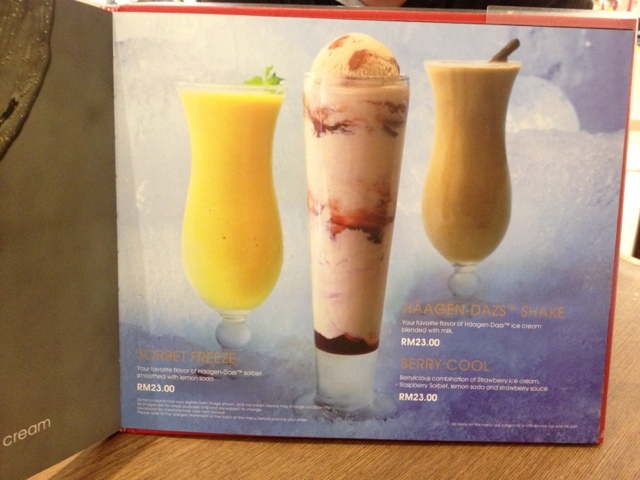 Menu of Haagen Dazs - very colorful and nice pictures!